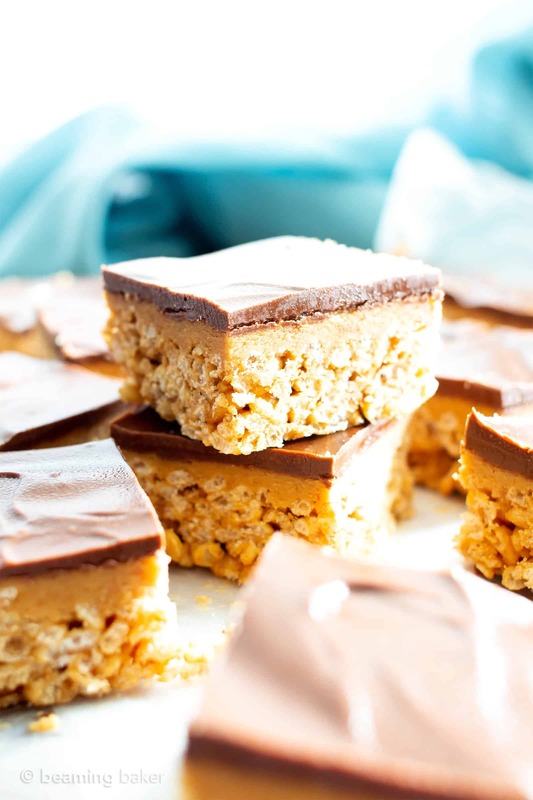 5 Ingredient Peanut Butter Cup Rice Crispy Treats (V, GF): a tasty recipe for thick homemade rice crispy treats topped with peanut butter filling, enrobed in decadent chocolate. Made with healthy, whole ingredients. Vegan, Gluten-Free, Dairy-Free, Marshmallow-Free. Welcome to my first official Halloween-perfect treat for the year! (Wait a minute… don’t gluten free fudgy walnut brownies, 4 ingredient peanut butter cookies and chocolate coconut macaroons count??) ???? You know I had to make it a good one. You might recall that a few weeks back, I shared this 3 Ingredient Healthy Vegan Rice Crispy Treats recipe. So far, the feedback’s been quite good. In fact, it’s become one of the most popular recipes of the fall. Woohoo! But you know what I HAD to do to that recipe: upgrade it by a million. And that’s no exaggeration. Okay, it totally is. But what would life be without some artful dramatization and exaggeration once in awhile? 😉 Anyway, what was I saying? Right! 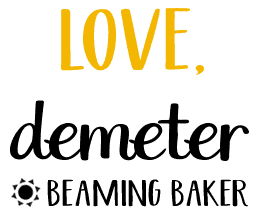 All of us here at Beaming Baker—all three of us—you, Erik and me…had to take a quick/2 year break from homemade rice crispy treats on the blog. So when we came back to this, we had to come back in style. 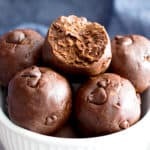 I was so excited to share that super easy, 3 ingredient recipe, but I knew that we could do one better by adding in some more peanut butter, lots of chocolate, and all the layers. 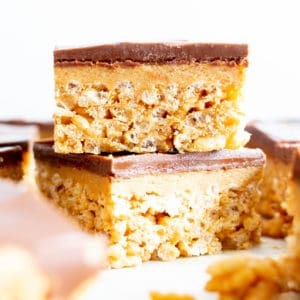 Layer 1: one deliciously thick layer of vegan rice crispy treats made with guilt-free ingredients and totally infused with peanut butter YUM. Layer 2: an almost laughably easy-to-make layer of peanut butter filling. Soft, peanut buttery (why, of course), slightly dense, but still soft enough to sink your teeth into. Just think, just dream, just salivate over what this must taste like. Or, go straight to your pantry immediately, put on your favorite no-baking tunes, and get to it! 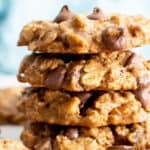 rarin’ to join your favorite BB peanut butter treats: Peanut Butter Chocolate Chip No Bake Energy Bites, Peanut Butter Chocolate Chip Oatmeal Breakfast Bars, No Bake Chocolate Peanut Butter Cup Oatmeal Bars. 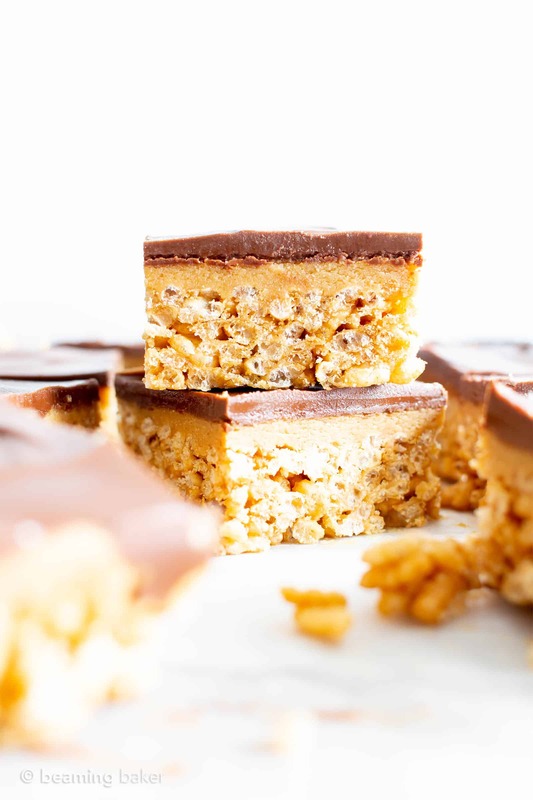 5 Ingredient Peanut Butter Cup Rice Crispy Treats (V, GF): a tasty recipe for thick homemade rice crispy treats topped with peanut butter filling and enrobed in a coating of decadent chocolate. Made with healthy, whole ingredients. Vegan, Gluten-Free, Marshmallow-Free. Line an 8-inch square baking pan with wax paper or parchment paper. Set aside for later. 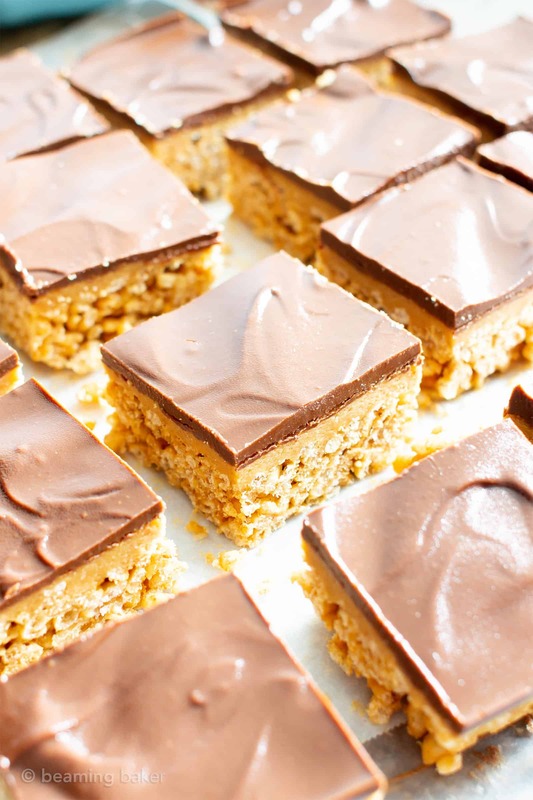 Make the Rice Crispy Treats: Add peanut butter and maple syrup to a large microwave-safe bowl. Whisk until well mixed and smooth. Heat in 20-second increments in the microwave until the mixture begins to dry out and reduce down/caramelize (about 4-7 rounds). * Whisk in between heating increments. Add crisp cereal to peanut butter mixture. Stir and fold until well-incorporated. Pour into the prepared baking pan. Using a rubber spatula, smooth into an even, very tightly packed layer. Chill in the freezer (about 10 minutes) while preparing the next layer. Make the Peanut Butter Layer: Add all Peanut Butter Layer ingredients into a bowl. Using a fork, stir and fold until well mixed and thickened. Remove treats from the freezer. 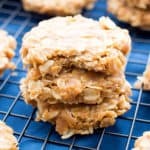 Transfer the peanut butter mixture onto the treats. Using a rubber spatula, smooth into an even layer, making sure to carefully keep treats layer intact. Chill in the freezer while preparing the next layer. Add the Topping: Add all Chocolate Peanut Butter Topping ingredients into a microwave-safe bowl. Heat in 20-second increments until melted and smooth, stirring in between each increment. Remove treats from freezer. Pour the chocolate mixture over the peanut butter layer. Using a clean rubber spatula, smooth in an even layer, tapping the pan as needed to smooth it out, or swirl the top to make it pretty! Chill in the freezer for 60-70 minutes. Mine took 70 minutes. The longer the treats are frozen, the cleaner the cuts when sliced. Remove and slice into 16 square treats. Enjoy! Storing notes below. 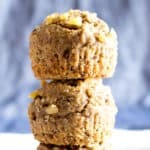 Adapted from my 3 Ingredient Healthy Vegan Rice Crispy Treats . 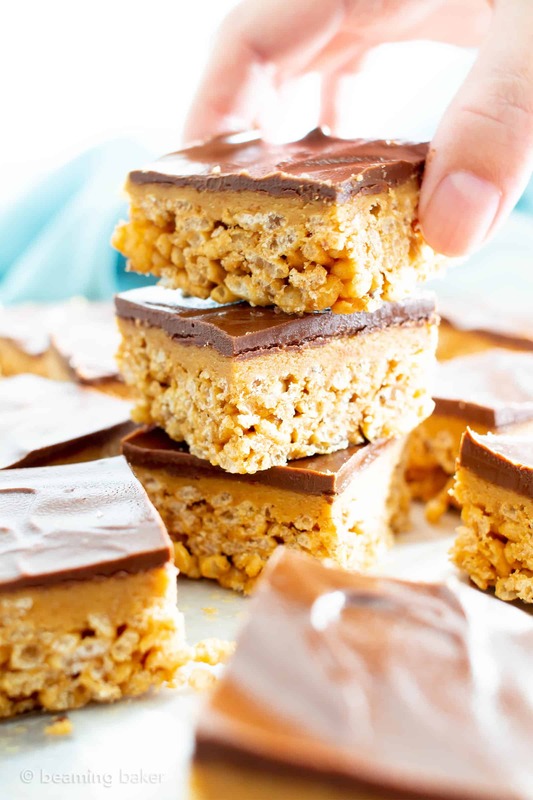 Try my Chocolate Peanut Butter Rice Crispy Treats and my No Bake Chocolate Pecan Bars. - *Stovetop directions: In a small saucepan over medium-low heat, add peanut butter and maple syrup. Whisk until well incorporated. Stir occasionally, heating until this mixture begins to bubble. - Store in an airtight container in the refrigerator for 1 week. Best on the first few days. Oooh these look incredible. So easy and so many awesome flavours! Yes! Nothing beats the PB and chocolate combo! my son would go nuts over these. 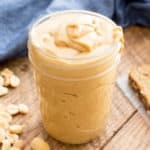 he is a peanut butter aholic these look fantastic! Mmm…these rice crispy treats look delicious! Thanks for the inspiration! Thanks Julia! Hope you like them! I haven’t had rice krispies treats in ages and this just might convince me to make some again real soon. 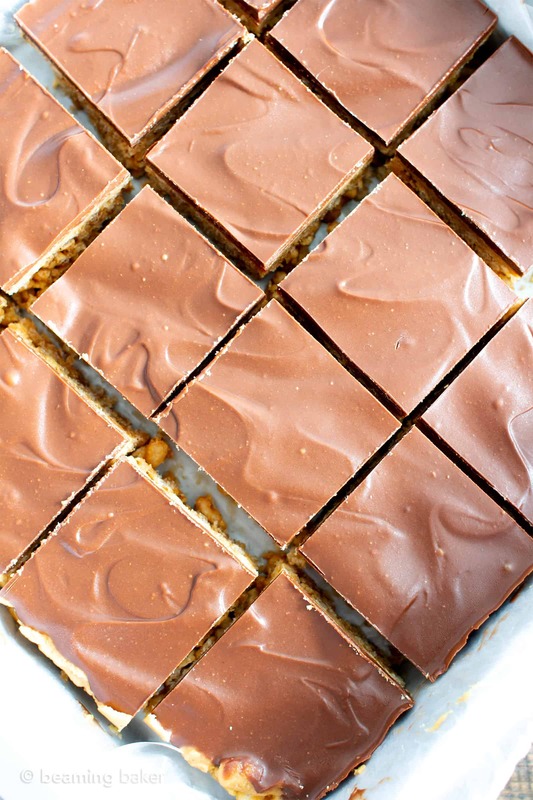 Love the sound of that layer of peanut butter topped with chocolate, 2 of my favorite things. This would be a great treat for the grandkids next visit. I’m sure your grandkids would love this! The peanut butter and chocolate layer are everything! What a great take on a classic recipe. 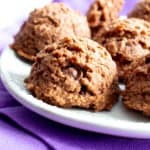 You can’t go wrong with chocolate and peanut butter – plus they’re healthier! A total win! My daughter has recently been diagnosed with MS and we are ,in addition, removing gluten, dairy and refined sugar from her diet. So far, so good. I’m so glad I stumbled onto your site as I have been having trouble finding baking recipes that don’t look and weigh like stone. Do you have any recipes for loavaaes and bread? My daughter has recently been diagnosed with MS and we are ,in addition to meds, removing gluten, dairy and refined sugar from her diet. So far, so good. 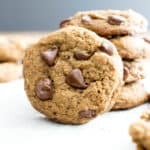 I’m so glad I stumbled onto your site as I have been having trouble finding baking recipes that don’t look and weigh like stone. Do you have any recipes for loaves and bread? These look Amazing! My kiddos would devour them, but can’t have Maple syrup. Do you think honey would be alright to sub for the Maple Syrup? Thanks Michelle! Yes, I think honey would work. 🙂 Enjoy! I subbed brown rice syrup! Everyone says they LOOK delicious – do I care what they think if they haven’t make them? C’mon, save us a non-review and MAKE THEM before commenting. I actually made them and they are delicious!! Thanks for bringing heaven to my friends and me!! Talk about an upgrade! I love that you revamped this treat! My crew is going to be so pumped! Woot woot! Hope your crew enjoys! That looks delish! I’m drooling over this right now, can’t wait to try this! These are really amazing treat!! Those look fantastic, craving these now! 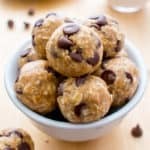 Love this easy snack options! Always a great recipe to have on hand! Thank you for such an amazing tasty treat. I made a batch and they were gone in a few hours. recipes. Thank you again from my family and I.
Hi Valerie, it was so wonderful to read your comment. <3 I can’t even tell you how much it pleases me that you made them 3x in a week! That’s a clear sign of a winner. 😉 Thank YOU so much for trying my recipes & taking the time to leave a comment. Hugs to you and your family. These look so good! 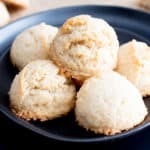 Could you recommend a substitution for the coconut flour? Hi Peggy! I’m not 100% sure, but you might try 3 tablespoons of GF oat flour. It might now be super firm, but that should be OK for this recipe. Let me know how it turns out! I madd these for some gluten free guests… They tasted great, but the bottom fell apart… Any suggestions? AMAZING! 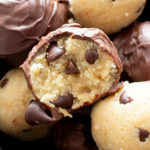 They taste just like a crispy peanut butter cup! Thank you for recipes I can always count on. And for a bright, sunny, joyful spot on the internet. Woohoo! ???? I’m so thrilled to hear you enjoy them Amanda! And thank you for the kind words—it’s truly my greatest joy to share these recipes with you. ??? ?